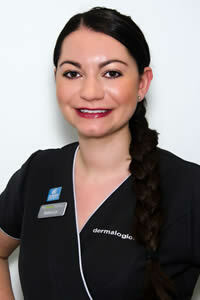 Andrea started at The Beauty Factory as a student and is now a Director. Over the years as treatments and products have changed or evolved her continued education has added to her wealth of knowledge and experience. I love my job because I work in a very professional salon with a great group of therapists. I get huge satisfaction from seeing results from all the fantastic treatments I do. With a really busy life, juggling work & kids, I love a bit of pamper time, turning my bathroom into a spa whenever I can (& locking the door!!! ), Natural Spa Factory scrub, Oil & Bath Nectar, leave me and my bathroom smelling amazing. Super Friendly & Chatty!!! !– Andrea is always happy to help, full of tips and advice and always happy to talk. Starting her beauty career in the spa industry, working in a Northumberland Hotel & Gleneagles. 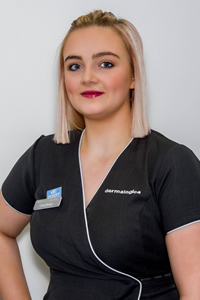 Using different brands and ongoing training has increased Rebecca’s knowledge and kept her up to date with product and treatment developments. Her passion is the skin, knowing how beneficial having the correct skin care routine and treatments can be. Rebecca is spoilt at The Beauty Factory with the choice of advanced equipment available to obtain the desired results for her clients. 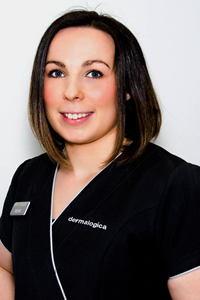 If you have any questions about skin fitness, either in salon treatments or your homecare, Rebecca is your go-to Skin Expert. Dermalogica Pure Light SPF50 is a must, I won’t leave the house without it, SPF’s are so important to protect your skin every day, all year round. As well as Overnight Retinol Repair, I use it to improve skin texture, it’s not only for signs of ageing. Having suffered with problem prone skin in the past, I have a strict skincare regime and once a week have ‘facial night’, which involves Dermalogica Rapid Reveal Peel and Multivitamin Power Recovery Mask, a well needed overhaul after a busy week. OCD – Obsessional Cleaning Disorder – don’t leave anything lying around, Rebecca will have it cleaned and put away before you know it. “Perfect treatment. Becca always makes me feel so much better. Love the result. Before arriving at The Beauty Factory, Rachel worked in a local salon & a spa, completing specialised massage training and becoming an advanced spa therapist, this is where she developed her love of massage, especially hot stones and now Pregnancy Massage. 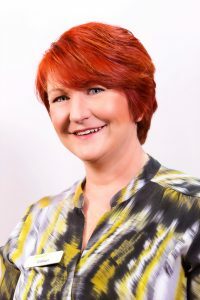 Rachel still enjoys massage, helping people relax and have some pamper time, but also being able to do a wide variation of treatments and keeping up to date with new, up & coming treatments and products. Having 2 young children and not much time for myself, a quick and easy routine suits best. A double cleanse starting with Dermalogica Precleanse, followed by Skin Resurfacing Cleanser – saves time,as I don’t need an additional exfoliator and leaves my skin fresh & clean. Small but super strong – don’t be put off by her size, you need to be on the receiving end of her powerful massage. Plus, any lids to remove, Rachel’s your girl. Courtney enjoys the more glamorous side to the job, lashes, nails & make-up. Youngblood Mineral Primer is fantastic for giving the perfect base for my make-up. Eating – Courtney can empty the fridge in one sitting (as long as it’s chocolate or cake)!! 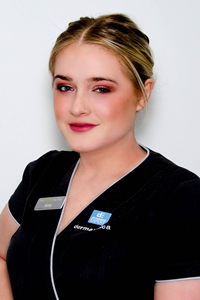 Amy started working with us, part time, while completing her final year at college. Since then she has completed advanced training all over the country (with her partner in crime, Courtney) building on her experience and knowledge. I’m an all-rounder, there’s nothing that I prefer to do, I like my day to be varied and enjoy working with all the new technologies. Youngblood Liquid Mineral Foundation in Shell is also perfect for my skin, it keeps my skin hydrated and doesn’t irritate. Awesome Amy & her Amy’isms’, unintentionally funny, with quirky comments and responses. Super intelligent with little common sense. I worked in a local salon for two years before setting up The Beauty Factory in 1990, after two previous locations in Blyth we moved to Havelock Street over 20 years ago. Although I don’t get the opportunity to carry out treatments very often, I’m a fully qualified therapist, completing four years training (a few years ago!). We’ve had lots of changes over the years and endeavour to keep up with the latest treatments and techniques and have some state-of-the-art equipment. 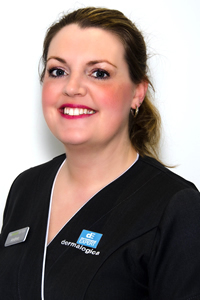 Of course, I love everything we provide but my favourite treatment and products have to be our signature facial, which includes CACI Facial Toning, Radio Frequency Skin Tightening and Re-Hydration Therapies, along with the Dermalogica AgeSmart range.